Barcelona and Catalonia are known for amazing food, but most people think of paella and other traditional food. 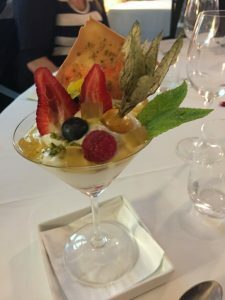 I was lucky enough to dine at a gem of a restaurant in Palafrugell in the Costa Brava region. The restaurant, Pa i Raim (literally, “bread and raisin”) is run by chef Rosette, a dynamic young chef who takes traditional Catalonian food and puts it on its ear. Rosette is the granddaughter of the famous Catalonian writer, Josep Pla and operates the restaurant in her grandfather’s charming home. The atmosphere is as inviting as the food is invigorating. Our dining experience started with a variety of tapas ranging from mussels with basil and hazelnuts, to anchovies with lime and ginger to foie croquant of Emporda with quince, raspberries and brioche. I tasted Jubugo ham, which puts serrano ham to shame. Oh, and the amuse bouche of cheese and onion soufflé had our small table of friends fall silent with awe. The main course was a choice between Hake prepared in two different ways, or Iberic suckling-pig sweetened in old wine and potato parmentier. Thank goodness my friend Sandy was willing to share so we each could try both dishes. And the pied-de-resistance….dessert…Recuit de Fonteta with honey ice cream and gelatin was so beautiful I didn’t want to disturb it, but eventually did. After dinner, Rosette came out to speak to us about her pride of Catalonian cooking, inspiration for new recipes and friendship with some of the greatest chefs in the region (Ferran Adria of el Bulli). Here is Rosette with my wonderful friend, Claudio Hermani, who introduced me and our group of Epicurean Travel adventurers to Pa i Raim. What a memorable night!